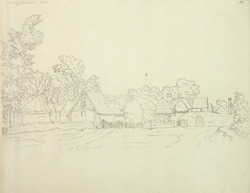 A north-east outline view of the farm buildings at Kirkby Hardwick. It is known that in 1530 Cardinal Wolsey stopped here for the night on his way to answer charges from Henry VIII. He died several days later at Leicester Abbey.